Note: This kit is now replaced by the Ultimate3 kit! 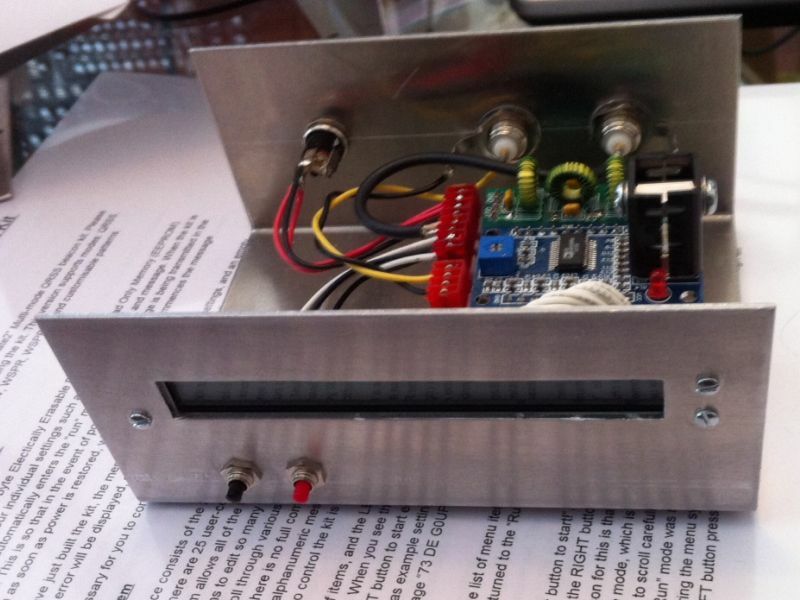 Version k - operate QRSS and WSPR at the same time! 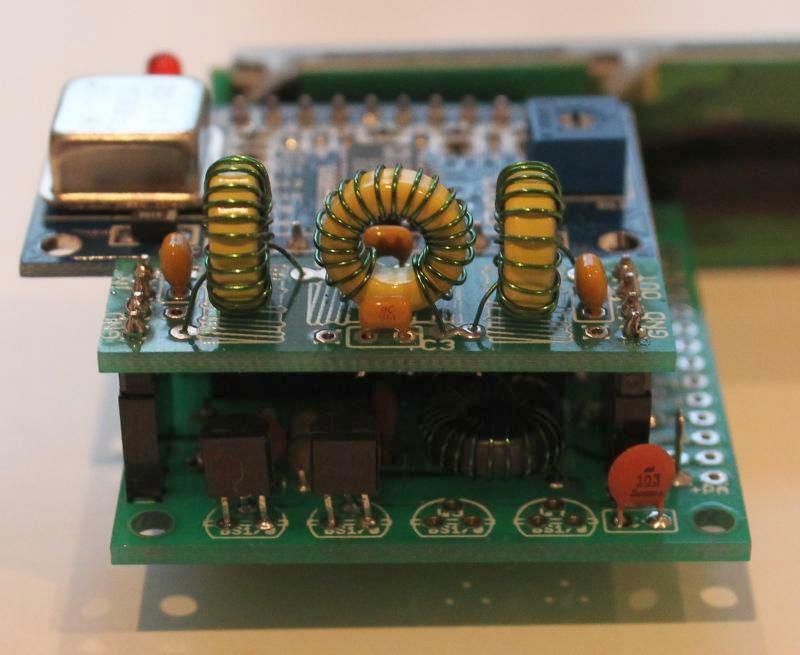 The ultimate QRSS Transmitter Kit is a new version of the original Ultimate QRSS kit. This new version comes with a pre-assembled AD9850 DDS module, and plug-in low pass filter modules which are also available separately for any band. 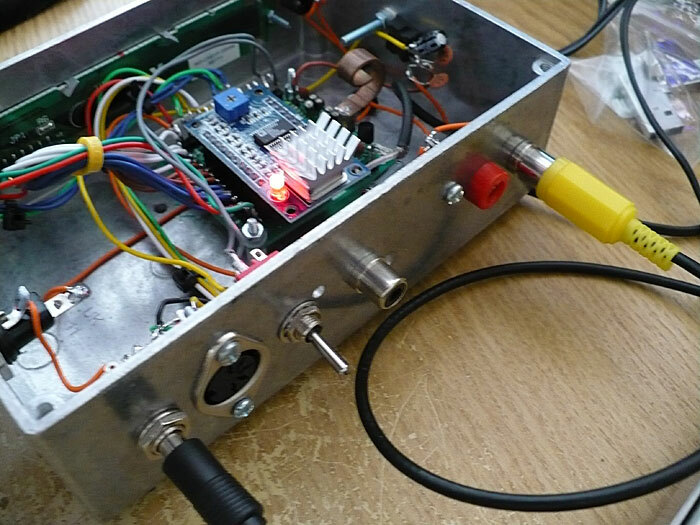 The kit can transmit on any frequency from audio (500Hz) to over 40MHz, and changing bands is a matter of plugging in the appropriate low pass filter kit to attenuate unwanted harmonic output. Printed instructions are not supplied with the kit! You need to download them here. You need THREE manuals, and to choose the version appropriate to your PCB and firmware version: the Assembly manual, the Operating manual, and the Low Pass Filter kit manual. The Revision 2 PCB's have "Rev 2" printed on them near the PCB edge. If there is no revision printed, it means you have the 1st version (Rev 1). Assembly instructions Board rev 1 click here! Board rev 2 click here! 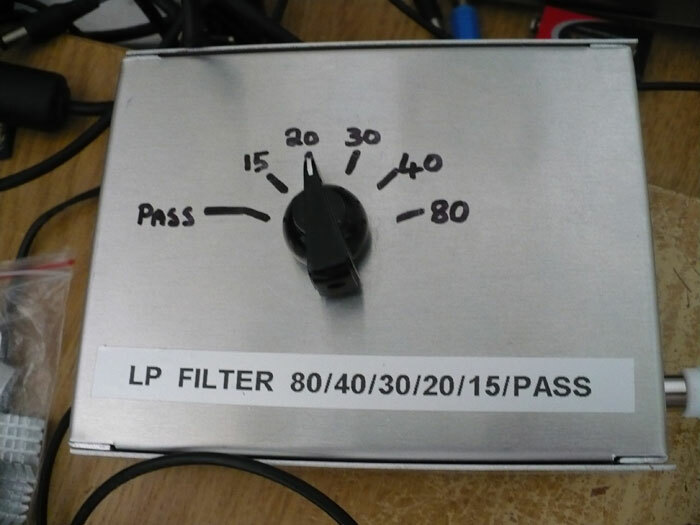 Low pass filter kit Download from page here! Old original instructions, prior to separating the assembly and operating manuals, can be downloaded here. 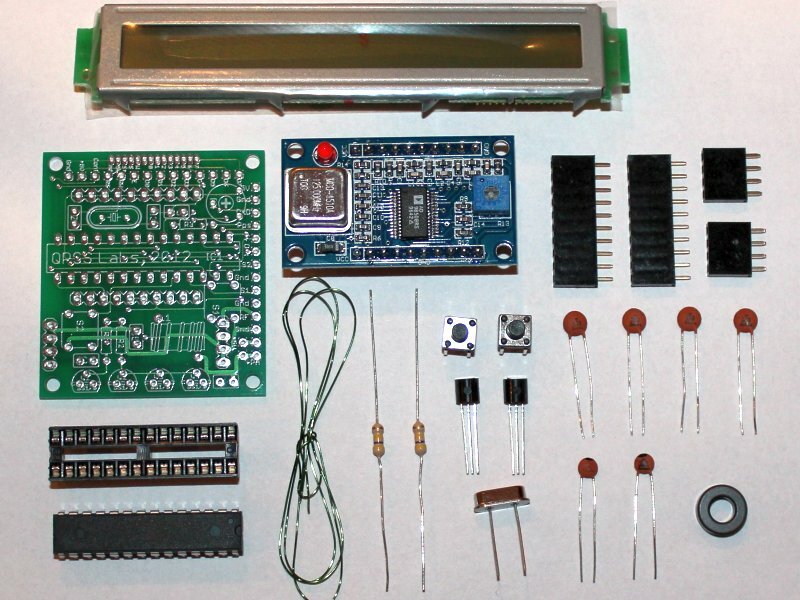 The kit contains the PCB, LCD, programmed microcontroller, pre-assembled DDS module, all board-mounted components, and a LPF kit for one band. Download the instruction manual using the link above. 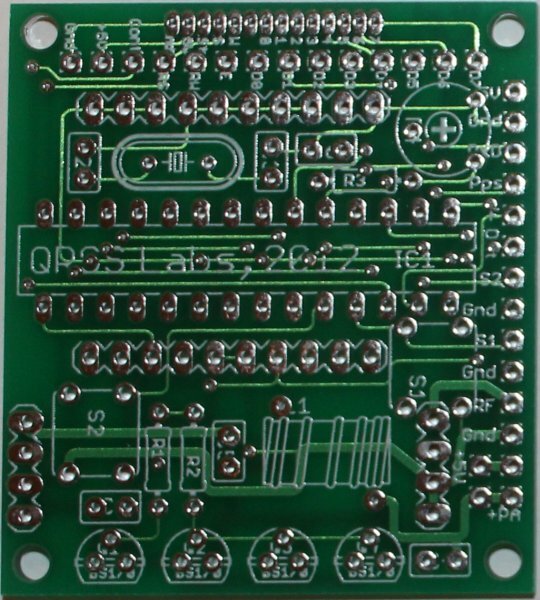 The PCB is quite compact and care is required in the construction. A rich array of functionality is provided by the design; please read the instruction manual to understand the facilities provided. Builder modifications will be shown on this page as they are developed! Dimensions: the LCD module is 108mm x 20mm. The main board is 43 x 48mm. 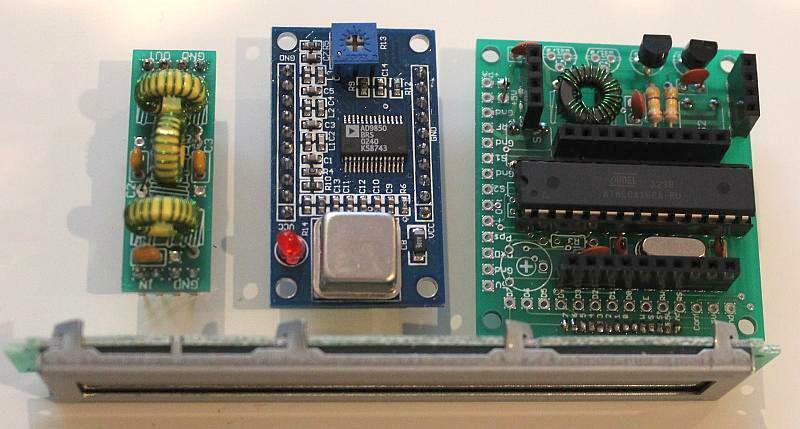 The main board with the DDS module and LPF kit plugged on top, and buttons on the underside, will measure 50mm x 48mm x 32mm. 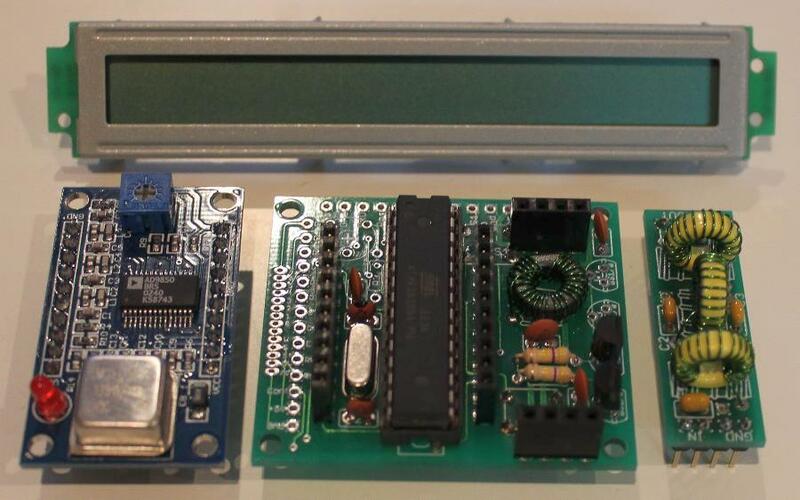 The overall size of the assembled modules depends on what LCD mounting option you choose. Please see the manual for the options. 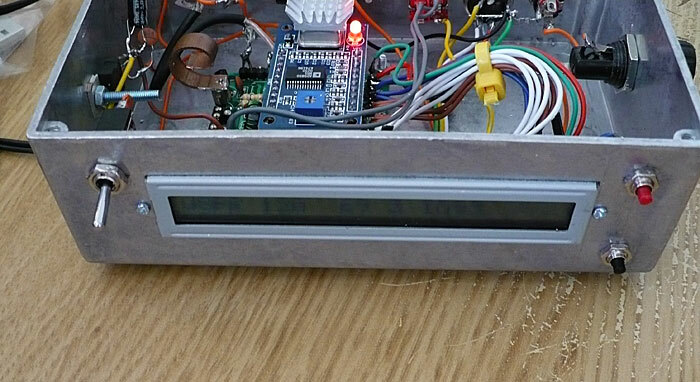 With the recommended option 3 (LCD soldered to the board at right-angles), the overall size of the assembly will be 116mm wide x 56mm deep x 32mm high. Trimble Silvana ACM Built-in dpieshop 09600,01,1,8 Uses Trimble Condor C1919A GPS module; requires 3.3V regulated supply. Reyax UP501 Built-in eBay, GBP 17 09600,10,1,8 Requires 3.3V supply. Note different "GPS Baud" setting. Do NOT use pull-up resistors! 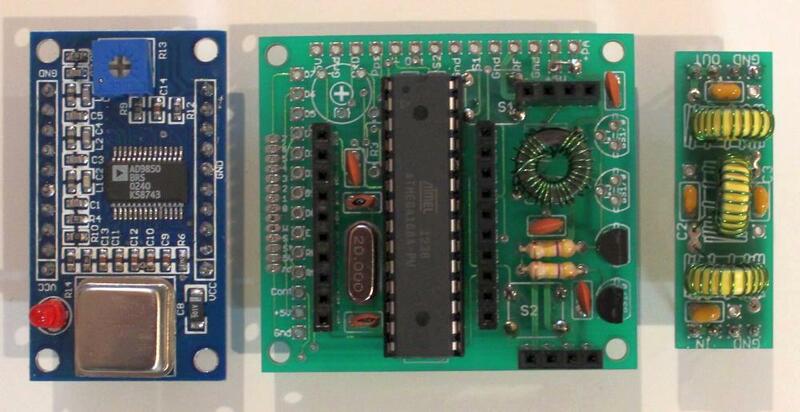 EM-406A Built-in Sparkfun or Expansys or Proto-pic 04800,01,1,8 Works with firmware v2.03 and above. - Not used the on-board LP filter as I’ve built a switchable external filter box to give me quick band change. 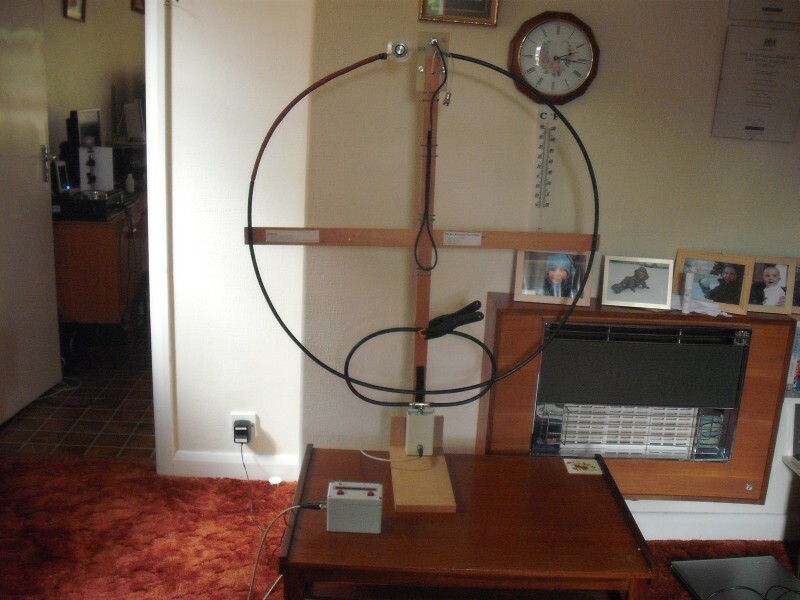 Here's a picture of Peter's coffee table station, using a coaxial ring antenna. Peter and 25 more members of the Crawley Amateur Radio Club (UK) are building the Ultimate2 as a club construction project. 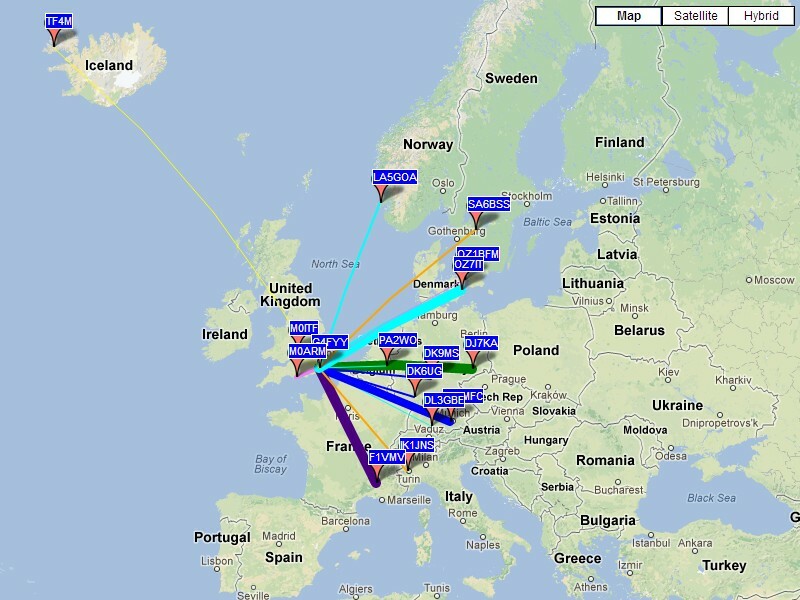 As you can see from the map (30m, 5'th May 2013) Peter's signals are certainly getting out fine! Antenna details are available at the links below. 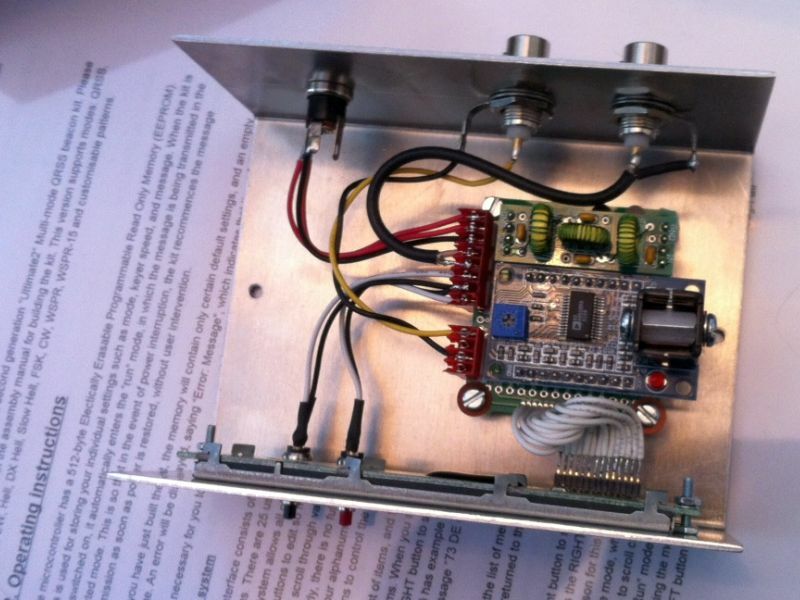 Keith G6NHU - Keith wrote a blog about his experiences with the kit, see here. Len KA7FTP - very nice job! 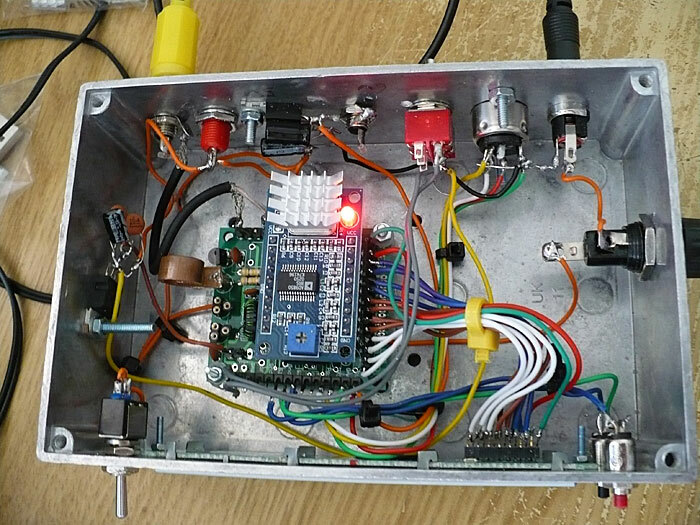 Version 2.02k/2.03k - Operate WSPR and QRSS at the same time! Note: from version v2.04, the "k" version was merged back into the main firmware version. This is a special experimental version, with changes requested by Keith Maton G6NHU. 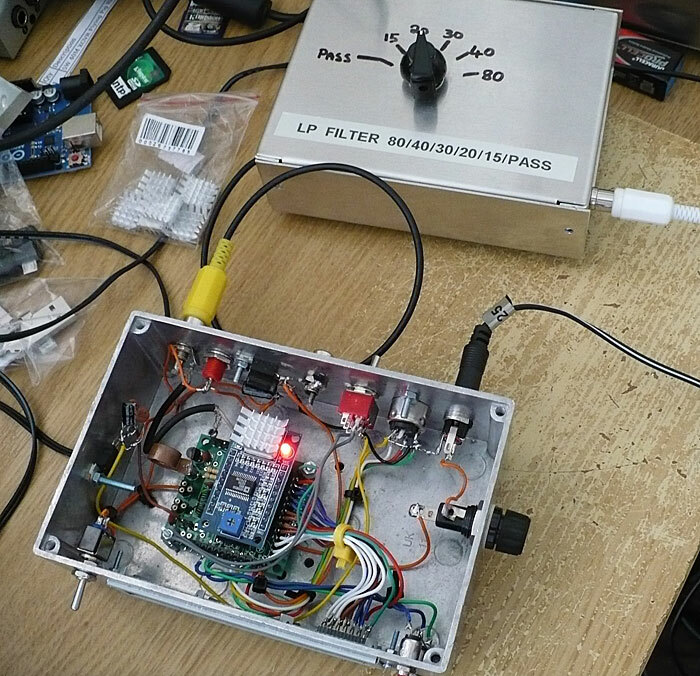 The "k" in the version name is in fact, for "Keith", who wanted to run WSPR and QRSS modes at the same time. So this version always transmits one WSPR frame, then follows this with the message of your choice, in the mode of your choice. 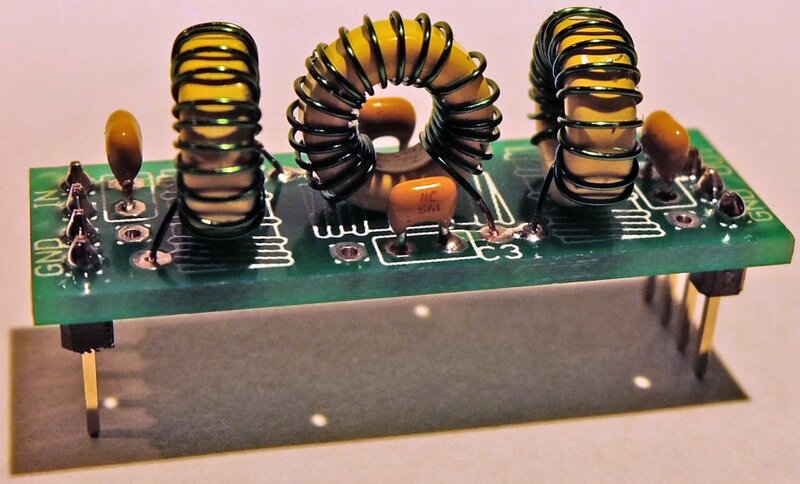 Different frequencies can be set for the WSPR message and the QRSS message. b) In order to provide code-space for these modifications in the 16K program memory available on the microcontroller, this version no longer supports any Hell modes, or the WSPR-15 mode. d) Free-running transmission is now not possible: you MUST choose a valid WSPR frame and Start. 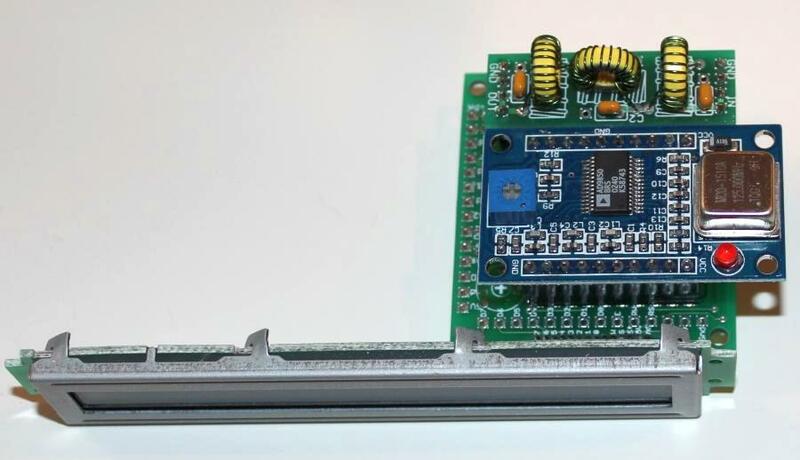 10 minutes is strongly recommended, and should provide enough space for the 2-minute WSPR transmission and your QRSS-mode Message transmission. e) Enter your call in the “Callsign” menu setting, this is now used only for WSPR. The “Message” setting is used for the QRSS mode transmission. This version has its own special operating manual, please CLICK HERE!. The following chart shows the number of LPF kits ordered to date for each band. Many people order one Ultimate2 kit with multiple LPF kits so that they can change band.